Facebook has always been a great medium to stay in touch with people and know what they are doing in their life. Be it a matrimonial status or getting a job, almost everyone updates about their day to day life on Facebook. Other than that, viewing various posts, memes can be a great source of entertainment and different inspiring quotes can also boost your motivational level. Facebook is always a great talk in any family gathering or friends reunion. If you truly feel the need to be a part of the conversation, you need to be somewhat active on Facebook. Apart from that, Facebook can be really time-consuming at times and many people prefer to shut it down. Or some may even think it to be a waste of time as it is overcrowded with people and they do not feel the need to use it. In that case, they might decide to stay away from Facebook. However, instead of deleting your Facebook account permanently, you can also try temporarily deactivating your account. But, if you have decided to permanently shut down your Facebook account, then it is possible and this article will let you know exactly how. What should you do before you permanently delete your Facebook account? It is alright if you have come to the conclusion that you will delete your Facebook account permanently. But, there are numerous crucial things you must realize before you decide to remove it. Although you want to get rid of your Facebook account, isn't it true that you made a lot of friends online? Facebook has always been a constant companion who made you stay in touch with people, share your ideas, experiences, etc. And there are many people with whom you might lose contact. You might also have people who look up to you and wait for your posts. It won't be fair if you go without informing them. So, it's necessary that you announce that you will be leaving Facebook permanently. You can update a status 2 or 3 days before and let people know. Sometimes, out of frustration, you might take a wrong decision, and deleting Facebook might be one of the choices. Eliminating it permanently won't let you log in the same account again. So, you have to be sure if you really want to take the decision. Think about it calmly and decide whether you want it or not. If you're going to stay away for a short period of time, deactivating your account might seem like a way better idea than getting rid of it entirely. If you have really come to the conclusion that you will delete your account permanently, you can go through all your pictures and store them in your gallery so that it won't be lost. Once you store all of it, you can delete your account. You can screenshot all the posts, important chats and save them too. Go through your account minutely so that you don't miss out on anything and regret it later. If you have decided and made the decision consciously, you need to stick to it. Do not be distracted by it again and try to reopen. And do not start having any regrets once your account gets removed from Facebook. Think about all the positive sides of not having a Facebook account and follow the procedure of deleting it. 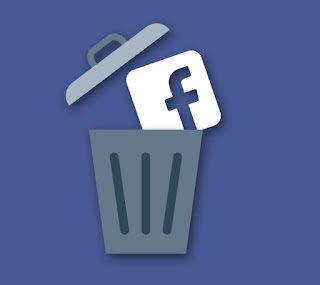 If you have finally decided to leave Facebook and have stored your important data, you can think of removing your account. If you want to remove your Facebook account permanently, you have to understand that you will lose all the data that is present and the account won't open again. You will also not be able to use Facebook messenger from your account. Other than that, if you have signed up for other apps like Pinterest or Spotify from your account, you won't be able to use it. Even if you want to use it, you have to contact the apps and website to use it again. However, your friends will still be able to view your chats in the message section. In order to delete your account permanently, you have to follow these steps. After you log in to your account with the required credentials, at the rightmost corner of your page, you will find three horizontal lines. Click on the button and you will see a series of options like the groups you are present in, or the pages that you have created. Once you tap on the Settings section, if you scroll down, you will find the option of deleting your account and all its information. This will erase all your data from your account and you will be a step forward in removing your account. You need to enter your Facebook password for privacy concern. And once you enter it correctly, you can click submit and can delete your account permanently. Can you cancel your deletion? Even after you submit your confirmation, there can be a chance of reactivating your account. The deletion process states that if you open your account before 30 days of account deletion, you can still use your account. But, after thirty days, all your data and your account will be deleted permanently and you won't be able to retrieve it. It might take ninety days to entirely erase the information and data from your account. However, during the process, others won't be able to view any of your pictures or posts. If you regret your decision of deleting your Facebook account permanently, you will get a time span of thirty days to cancel your deletion process. For that, you have to simply log in to your account and select the option of “Cancel Deletion,” and you will be able to retrieve your account. Getting rid of your Facebook account should never be a hasty step because it is going to determine whether your online friends are going to have any access to your posts or not. Moreover, you should be firm about deleting your Facebook account once you have clearly made your mind. Rising privacy concerns and increasing cases of data breaches have led to most of the people being highly insecure about keeping their Facebook accounts. We hope that this guide comes handy when you are struggling with the correct steps to follow in order to eliminate your Facebook account from this somewhat controversial platform. As you know Android 7.0 Nougat has a new layout for keyboard settings which gets really hard for you to turn off the auto correct on Android Nougat. You will find the list of keyboards on Languages and input settings which are installed from Google Play Store. You could access the Virtual Keyboard and Physical Keyboard from here easily. Let us know the difference between a Virtual Keyboard and Physical Keyboard which are installed on the device. Well, a Virtual Keyboard has to do with Google Keyboard, Swift Keyboard, Swype Keyboard and Grammarly Keyboard like apps. Whereas a Physical Keyboard has to do with wired and wireless keyboards which are attached to the phone or device. In order to turn off auto correct in Android Nougat, You must navigate all the way to Virtual Keyboard settings and You could able to make a selection for the keyboard app, Whether it is Google Keyboard, Swift Keyboard, Swype Keyboard or Grammarly Keyboard and you can then change settings for it. First you need to open the device Settings. You need to then Navigate and Select Languages & input from there you will be able to select the Virtual keyboard. As you might be having Keyboards from Google Keyboard, Swift Keyboard, Swype Keyboard or Grammarly Keyboard, Please Select your Keyboard app which you often use, In My case I often use a Google Keyboard as it is Integrated with Inbuilt Google Search Option. You could also able to find other text corrections too like Auto space after Punctuation, Auto Capitalisation, Double space full stop and spell check to be toggled on and off for Auto correction. Conclusion: So if you have followed the above steps clearly, You could prevent the Keyboard from auto correcting itself when you are typing something which isn’t found in the Dictionary or not itself comes under English. Xiaomi launched Redmi note 5 pro this year. It is one of the best selling smartphones till today offering more features at a good pricing which is affordable to everyone. Xiaomi comes preloaded with MIUI Interface which is different from Google Stock Android. MIUI Offers deep customization which many people seem to like. But it is often confusing when new Xiaomi users have to make a change towards the settings. Most Xiaomi users are confused with turning off the auto correct feature on Android. You must first go to settings on your redmi note 5 pro. You should find yourself a list of keyboards under languages and input settings. You will find yourself confused with Virtual Keyboard and Physical keyboard, To put it simple basically a Virtual Keyboard is List of keyboards offered from Google Play store like the Google Keyboard and Physical keyboard is the external keyboard. 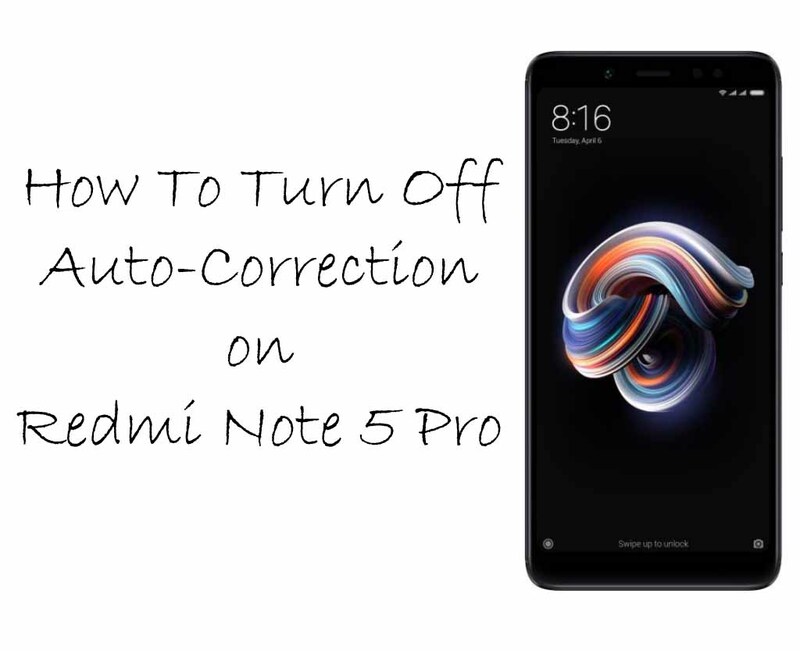 In order for you to turn off the Autocorrect in redmi note 5 pro, You must head over to settings on your redmi note 5 pro and from there after going to list of keyboards which are found under languages and Input settings to make a default selection of keyboard app for changing the settings of Redmi Note 5 pro, In order to turn off Autocorrect. Go to your Redmi Note 5 Pro Settings and then select Languages & input followed by clicking the Virtual keyboard. If you have followed the above steps clearly, You could prevent the Keyboard from auto correcting when you are typing something which isn’t found in the Dictionary or Does not itself comes under English. Xiaomi Mi A1 is an Android One Smartphone which comes with Google’s Stock Android and Different from what Xiaomi Phones used to offer. Usually, Xiaomi Phones comes with a very popular easy to use operating system known as MIUI Interface which is highly preferred by most Xiaomi Fans. Mi A1 has an advantage from other Xiaomi Phones in terms of receiving latest Android Updates. Xiaomi Phones could get instant latest updates from Android Nougat to Oreo and Android Pie as well, Once after it is available. 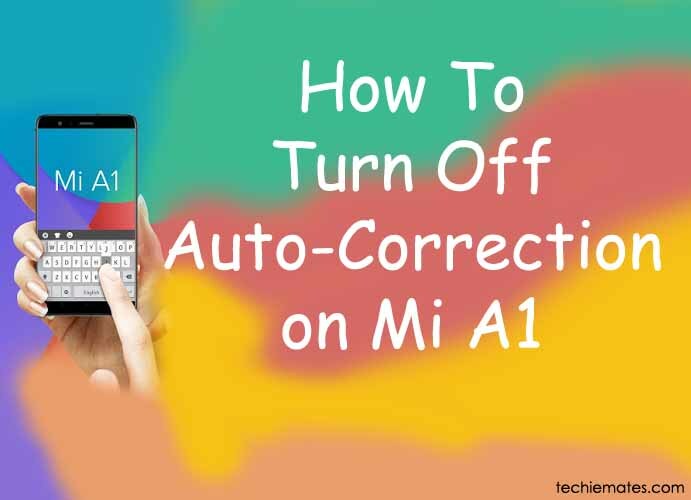 Most of the people prefer latest updates and Because of this, It is often confusing for people to turn off autocorrect in their New Xiaomi Mi A1 phones which looks very different from their MIUI Based Xiaomi Phones. First Head over to settings and try to find Keyboards on Languages and Input settings which you install over the Google Play Store app. You will be able to access the virtual keyboard and physical keyboard from here. First, we must know the basic difference between the Virtual and Physical keyboard which are installed and present over the device. Virtual keyboard includes a variety of keyboards that are downloaded from Google Play store and a Physical Keyboard has to do with Connected External Keyboard. So to turn off autocorrect in Xiaomi Mi A1 of the Google’s Stock Android, You first need to head over to Mi A1 settings and find virtual keyboard settings and then make the default selection of your keyboard app. Then you can further change settings from there. First you need to open the Xiaomi Mi A1 Settings. Facebook is famous all over the world. Here users can make friends, upload photos and can chat with them also. But at times logging out can be difficult too. There are two ways in which any user can log out of Facebook on Android. The two ways are given below. Users just need to follow them in order to log out easily. Click on the Facebook icon present in the Home Screen or in Application Drawer. Once Facebook is open, tap on the right end button. Then keep scrolling downwards. The last option will be the logout one. Just click on the logout option. Facebook will get logged out. Next time when users open Facebook they will need to log in again. If there is a problem in the 1st way of logging out, then users can follow this way also. 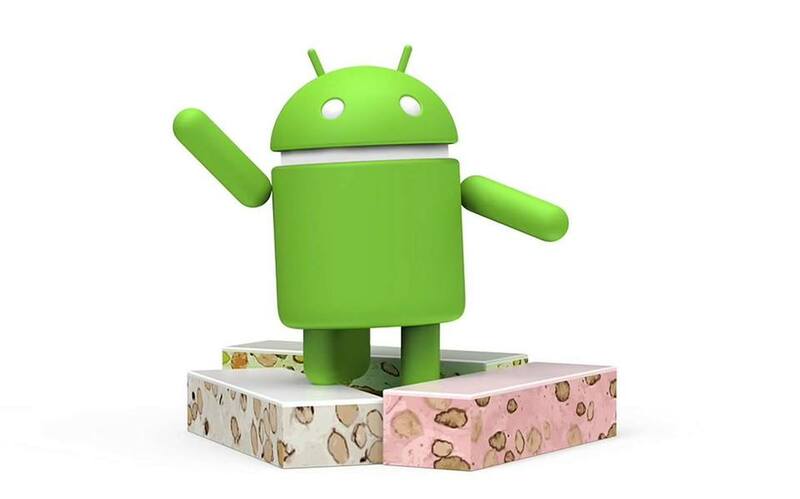 Open the Android device setting. This is a grey coloured gear shaped icon. It is present in the home screen or application drawer. Scroll downwards and tap on the app button. This generally comes under the device header. Now there will be three tabs as Running, Installed and All. Go and select the All app tab. Scroll down and select Facebook icon. The apps are generally listed in alphabetically order. Tap on Storage. If the storage button is not available then just tap on clear data option, then just skip the next step. Tap Clear Data. There will be a confirmation coming up asking if the user wants to delete the app’s settings and files. Then after reading tap the OK button. Otherwise just follow the next step. Tap the home button. This will take the users back to the home screen. Open Facebook. It will ask the user to log-in again when they open Facebook next time.